69310 was the TRSB (Trailer Restaurant Standard Buffet) from BR Southern Region class 420 4BIG unit 7040. It was built in York in the mid 1960s. The 4BIGs were a variant on the more numerous 4CIGs with a buffet instead of another trailer. 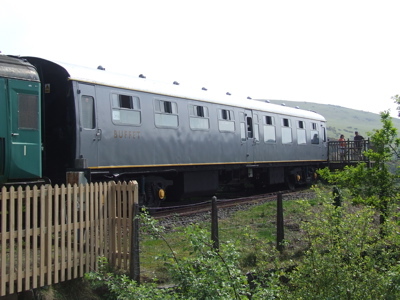 They operated on the London-Brighton line. The similar 69332 is also on-site, unrestored. We have an information sheet (123Kb) with more detail.